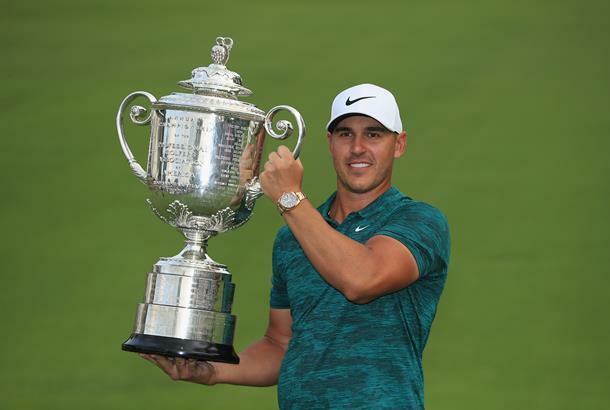 Brooks Koepka became the fifth player in history to win both the US Open and PGA Championship in the same year on Sunday, claiming his third major title by two shots on a thrilling final day. Amid a threatening Adam Scott, a sensaional round from Tiger Woods and the exceptionally loud, large crowds, Brooks Koepka seemed unflappable as he claimed his third major title. With the exception of an early round sutter that saw him card back-to-back bogeys from the fourth, Koepka seemed unfazed as Woods climbed the leaderboard in search of his 15th major and his playing partner Adam Scott began to roll in birdie putts. He didn't even wait to have the final putt of the championship, and there was no outburst of emotion as he tapped in his par putt and let Scott have those final hole honours. In fact, to anyone who hadn't looked at a leaderboard all day, you could have been forgiven for thinking he hadn't just won his third major title in the space of 14 months and set the PGA Championship scoring record. "It was so close to the hole," Koepka said. "I didn't want to take away from anything that he was doing because I knew he needed to make the putt (to stay tied 2nd with Woods), and I kind of wanted to get out of his way." And perhaps more impressive is how far he's come to do it. Koepka was sidelined for a lengthy period of time with a potentially 'career-threatening' injury earlier in the year and was forced to miss the Masters. He then successfully defended the US Open in just his fifth start back, before adding his latest major triumph only a couple of months later. But will this victory now stop him from being overlooked and underrated and see him instead recognised more for his achievements? Koepka had begun the day with a two shot lead and instantly increased that with a birdie on the first, but as he carded two bogeys early in his round the packed leaderboard began to make the day feel like it could belong to anyone. Justin Thomas briefly held a share of the lead but errant tee shots that saw him hit crowd members with the ball eventually cost him, and Koepka regained control with three birdies in a row from the 7th to make the turn in two under par for his round. Koepka made two par saves at 10th and 11th, but then missed two good birdie-chances as his putter began to cool down, and he once again found himself tied at the top of the leaderboard - this time with playing partner Adam Scott, who made five birdies in seven holes to get to 14-under by the 13th. Meanwhile, Tiger Woods was making a charge of his own, and with four holes to play Kopeka and Scott had a one shot lead over the 14-time major champion. With it all to play for and the par-five 17th to come, it felt like Woods needed a couple more birdies to really have a chance, but his unreliable driver let him down as he found himself needing to play from the hazard. It would be a par, and a final first pump at the 18th hole as he saw in a 20 footer for birdie gave him a chance as he tied Scott at 14-under-par. But by that point, Koepka was dialled in. He made back-to-back birdies at a crucial time to move two shots clear with two holes to go, and even a missed chance at the 17th kept him in control as Scott began to get wayward with his drives on the homeward stretch. A final hole par for Koepka and bogey for Scott left the 28-year-old American with a two shot victory for his second major of the year, something he put down to a huge amount of self belief on the day. "I have a lot of self belief," said Koepka. "I knew, even today, when everybody was making that charge, if I just hung in there, made one more shot, one good shot at a time, kept it rolling, I knew I was going to have a chance to kind of separate myself maybe a little bit, and that finally came on 15. "And then to hit such a good shot on 16, and especially to make the putt when Scotty almost chipped it in. You know, that could -- if I missed that, that could be a real role reversal right there." The story could so nearly have been about Tiger Woods. The sizeable, roaring crowds, some unbelievable 'vintage Tiger' shots and eight birdies made it feel like we were about to see him carve out his own slice of history with the joint-lowest round of the day, but he would have to settle for second place in the end. And while there can be no doubt now that Tiger is back, Woods himself admitted it's pretty hard to beat a guy like Brooks Koepka when he's playing that well. "I played with him in a practice round and he was literally hitting it 340, 350 in the air," said Woods. "And when a guy's doing that and hitting it straight and as good a putter as he is, it's tough to beat." It could easily too have been about Adam Scott, who was motivated by good friend and fellow Australian Jarrod Lyle's passing earlier in the week. But while Scott was frustrated with his own performance, he credited 'big time player' Brooks Koepka for his. "What has been interesting to watch is, since then (his 2017 US Open win), how much of a big time player he is. I think I've heard some frustration that he hasn't won a lot of other tournaments, but he's won three Majors now, so he's definitely winning the right ones. "I think, if I was him, I wouldn't change much at the moment. I'd just keep doing what he's doing because he's showing up at the right moments in the biggest events. I can see he's got that mindset. There's something inside his brain that makes him believe that that's what he's destined to do." And with this win, Brooks Koepka joins Tiger Woods, Jack Nicklaus, Gene Sarazen and Ben Hogan as one of only five players to win both the US Opena and PGA Championship in the same year. He also joined Jordan Spieth, Woods, Nicklaus and Tom Watson as the only players with three majors before turning 30 since World War II. Stewart Cink and Jon Rahm shared fourth place honours at 11-under-par, while Thomas Pieters (who is searching for a wildcard spot in to the Ryder Cup team) shared sixth place at 10-under with Francesco Molinari, Justin Thomas and Gary Woodland.